Homes for All. As one city after another comes to terms with the severity of the housing crisis in the United States, these three words have become a national rallying cry. They extend to housing the principle that has already made Medicare for All and free college hallmarks of a rising democratic left—the principle that, especially in a wealthy country like the United States, everyone has a right to shelter, healthcare, and education. If the housing crisis has been slow to register at the level of national politics, it’s not for lack of momentum at the grassroots. There is no major city in the United States today without a multitude of tenants’ rights groups, and “gentrification” has, in the span of a decade, crossed from left-wing academic journals into everyday language. From coast to coast, a loosely organized, intersectional, and bottom-up movement is coalescing around housing justice—the idea that housing is inextricable from a range of other issues like racial justice, poverty, the environment, immigration, and the rights of the formerly incarcerated. At the same time, the mainstream policy consensus continues to revolve around market-based solutions. But if the 2008 financial crisis hardly moved the needle for these policy makers, for a generation of housing activists it has done precisely that. Now, their questions are beginning to break into national policy debates—questions of collective ownership, decommodified land, and housing under democratic control. What might such housing look like? July of 2018 marked the second national #RenterPower assembly hosted by the Homes for All campaign, bringing more than 100 organizations and 300 people from across the country to Atlanta, Georgia. Spearheaded by the Right to the City Alliance, Homes for All came together in 2013 as a coalition of twenty-two organizations seeking to link local housing struggles. Their priority was to protect, defend, and expand truly affordable housing for low-income residents. In just five years, the campaign has spread to twenty-four states, with dozens of participating organizations. Inspired by Spain’s decentralized housing movement, the Platform for People Affected by Mortgages, or PAH, Homes for All also encourages the creation of autonomous local chapters and statewide formations such as Homes for All Colorado. The Atlanta assembly marked the release of the “Green Book,” loosely modeled on PAH’s popular organizing manual, to support more renters to organize their own tenant unions. Two ideas are central to Homes for All: that those most impacted must lead the movement, and that bolder action is required to solve the affordable housing crisis and stem the tide of displacement in communities. Homes for All’s model is based on what they call “trans-local” campaigns, connecting local struggles with similar ones in other communities. Take rent regulation. In November of 2016, in the Bay Area—ground zero for gentrification and displacement—members and allies of Homes for All succeeded in passing comprehensive rent control and just-cause eviction protections in Richmond and Mountain View through successful ballot measures. These were among the first new rent-control measures in the United States in the last four decades. At the same time, Oakland passed a ballot measure protecting tenants from illegal rent increases and unjustified evictions. This November, Californians voted on a statewide referendum to repeal the Costa-Hawkins Rental Act to allow municipalities to strengthen and expand rent control. * Similar efforts are gaining traction across the country. In Colorado there is an effort to expand the “warranty of habitability”—in effect, legal protection for tenants to withhold rent in the face of substandard housing conditions; in Boston, a campaign around anti-eviction legislation; in Providence, Rhode Island, and Austin, Texas, among dozens of other cities, campaigns to pass rent-control legislation are ongoing. Altogether, in 2016 and 2017, Homes for All led weeks of action in forty-five cities, winning tangible gains for local residents as well as continuing to draw attention to housing issues. Fighting evictions and foreclosures and capping rents are critical for defending renters and low-income homeowners from predatory real estate and transferring resources and power from the speculative market back into the hands of residents. But solving our enduring housing crisis requires going a step further. A 2017 study estimated that almost one-third of U.S. households live in unaffordable housing—that is, 39 million households spend more than 30 percent of their income on rent or a mortgage. Some 19 million households spend more than half of their income on rent, with the poorest renters facing the most severe burden. Market advocates claim that the problem is simply one of supply and demand: if we build enough housing, affordability will trickle down. But supply has been steadily growing at the high end of the housing market, and low- and moderate-income residents still struggle. To give one example among many, New York City today has nearly a quarter-million vacant housing units, while half of renters devote more than a third of their income to rent, and over 63,000 people sleep in homeless shelters. Market-based affordable housing policies do not come even close to meeting current levels of need, and the few subsidized units they create are often out of reach for the lowest-income families. Meanwhile, a legacy of underfunding and further proposed cuts to the Department of Housing and Urban Development (HUD) threaten the already emaciated public-housing system and Section 8 voucher programs. A crisis of this magnitude cannot be solved simply by correcting and regulating the market. Housing justice requires deeper change. For the Homes for All campaign, that means decommodified and democratically controlled housing. In the group’s recent report Communities over Commodities, which we co-authored, we lay out four models that have successfully met housing needs by partially, or fully, circumventing the market and putting control in the hands of communities. Although they remain mostly local experiments for now, each provides potential ingredients for a transformative, nationwide social housing program in the United States. Approximately 166,000 households in at least twenty-nine states currently live in limited-equity cooperatives (LECs), a long-standing, resident-controlled, and for the most part deeply affordable form of housing. Residents do not own their units in LECs. Instead, they become governing shareholders of the cooperative, which owns the property and pays for the underlying mortgage and taxes. As unit shareholders, residents are typically allotted ninety-nine-year leases, which include income restrictions, limit profits from the sale of shares, and protect households from unjust eviction. Early examples of LECs, such as the 1927 worker-developed Amalgamated Housing in the Bronx, demonstrate this model’s lasting benefits: high affordability, community commons, democratic control, neighborhood stability, and maintained habitability. A second wave of LECs came to New York in the 1970s: while parts of the Bronx burned, tens of thousands of tenants claimed their otherwise neglected housing and, in large numbers, over many years, converted these buildings to cooperatives. They didn’t do this entirely on their own, though. Robust tenant organizing efforts had already spurred federal financing for LECs in the 1960s. Likewise, the city established a mechanism to hold properties and provided technical and financial support for tenants to acquire, renovate, and self-manage foreclosed buildings. Tenants also contributed their labor as “sweat equity” to initiate the conversion process. Decades later, New York City is still home to almost 90,000 LEC units across some 700 buildings. Washington, D.C. saw similar efforts in the 1970s, led by renters facing mass evictions and early gentrification. By 1981, D.C. tenants, largely led by black women, had secured 6,000 units in LECs. As in New York City, municipal support was key. Strong city rental protections, including the conversion programs, were made possible by D.C.’s home rule in 1973. Conversion there continued from the first wave of gentrification through the recent housing bubble. In 2006, immigrant tenants formed the Martin Luther King Jr. Latino Cooperative LEC in the epicenter of the city’s heated real-estate market. Altogether, across the city, 117 LEC buildings remain. Today’s LECs represent fewer than half of those that existed at this model’s height. Created during a time of urban downturn, many LECs have since been swept up in the real-estate boom. During a period of declining municipal and federal support, welfare rollbacks, and stagnant household wages, many co-ops opted to become market-rate and allowed their members to “cash out.” Today, interest in LECs is growing again, but the model faces many obstacles. Preserving and expanding affordable, cooperative housing in the United States will require a broad-based effort, combining resident education and base-building, technical support, state incentives, long-term affordability restrictions, and hybrid models that combine LECs with community control of the underlying land. Although it’s easy to forget when surrounded by buildings, shaping the future of our cities still comes down to who controls the land. One model that has attracted a lot of attention is the community land trust (CLT), which takes land off the market and puts it under community control through a nonprofit organization that holds the land in trust. CLTs began in the United States during the civil rights movement as a means to support the independence and self-determination of black Americans in the South. Reverend Charles Sherrod, one of the founders of the first modern CLT in the country (New Communities in Georgia), summed up their rationale when he said “all power comes from the land.” Today there are close to 300 functioning CLTs in the United States, spanning from Boston to Baltimore, Albuquerque to Detroit, as well as a rapidly growing number of new projects, particularly in communities of color and low-income communities. CLTs are technically a dual-ownership model. The land is held in trust by a nonprofit, and residences can be held by individual owners, whether they’re houses, multi-unit buildings, or individual apartments. Residents who live on the CLT or in the surrounding community generally make up the majority of the governing board of the nonprofit corporation; other stakeholders and allies often also serve on the board. All of the land held in the trust is for the exclusive use of the owners and renters of the building and cannot be used as an investment or profit-generating enterprise. Homes are generally priced within reach of low-income residents, and resale equity is constrained. The result is that people stay put and are rarely displaced. Studies confirm that delinquency and foreclosure rates are significantly lower on CLTs than on homes bought with conventional loans. For example, in 2009, when 31 percent of subprime loans and 7 percent of prime loans were seriously delinquent, less than 2 percent of loans for CLT properties were. When 16 percent of subprime loans and 3 percent of prime loans faced foreclosure, only 0.6 percent of CLT properties did. Even in the few cases where homes were foreclosed on a CLT, the trust was able to retain the home and preserve the affordability in the community. While there are no studies on eviction rates on CLTs, those with large rental portfolios like the Champlain Housing Trust, Dudley Street Neighborhood Initiative, and Sawmill expressly seek to prevent them through policies of just-cause eviction, used only as a last resort. While CLTs are gaining momentum across the United States, the Homes for All movement also takes inspiration from examples of decommodified, community-controlled housing abroad. In Germany, “tenement syndicates” emerged from the squatters’ movements of the 1970s and ’80s. In this model, a housing project is jointly owned by the residents and an umbrella organization, or syndicate. The syndicate runs a network of housing projects, and pools resources to support the projects and expand the syndicate to new buildings. Although each housing project remains autonomous, the syndicate plays a supervisory role that prevents speculative resale and advises the local housing projects. Tenants themselves are at the helm, and participate in governing, management, and labor. There are currently more than 110 such syndicates in Germany. In Uruguay and other parts of Latin America, “mutual-aid housing cooperatives” collectively own land and build homes for families. Families take part in the building of their own home along with other community members. The final ownership is retained by the cooperative, but housing can be transferred to the family, and across generations. This keeps the housing affordable by relying on “sweat equity,” while also building skills for those who participate. This sweat equity helps reduce the overall cost of the project by 15–20 percent. A combination of tax exemptions and a “solidarity fund” also help support the expansion of mutual-aid coops. Institutes of Technical Assistance also help train and educate new housing projects in the principles and skills of cooperative management and the construction process. 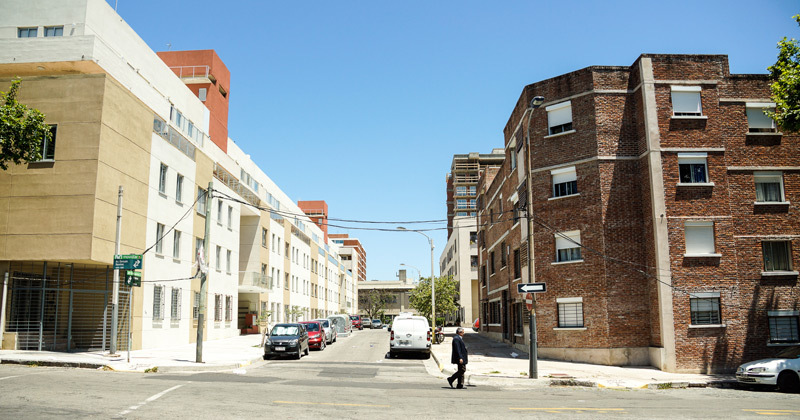 While the cooperatives declined under Uruguay’s military dictatorship in the 1970s and ’80s, they have received renewed support since the 1990s. While each of the alternative models we’ve described seek to decommodify land and housing to varying extents, they do so within the constraints of the current economic system. Each of them engages the market in some ways, but ultimately aims to reduce its influence, shielding land and buildings from speculation in order to ensure stable, permanently affordable homes. Can any of these models reach the scale needed to address today’s housing crisis? On one hand, we have already seen that these projects have the ability to grow. As of 2006, there were still 425,000 units of limited-equity cooperative housing in the United States. FUCVAM in Uruguay today houses over 90,000 people, equivalent to roughly 5 percent of Montevideo. The largest CLT in the United States, the Champlain Housing Trust in Burlington, Vermont has grown to include 2,765 homes since its founding in 1984, including 2,200 rental and cooperative apartments and 565 houses. Half of these holdings are located within the city of Burlington itself, and comprise 8 percent of the city’s housing stock. As Brenda Torpy, the land trust’s chief executive officer, explained to Slate, the trust’s operating budget is $10 million, but that pales in comparison to the nearly $100 million in development capital that the CLT generates annually—capital that goes toward new loans and development, as well as maintaining existing properties. These alternatives will not succeed on their own, however. Even the Champlain Housing Trust, now largely self-sustaining, would not be where it is today without a substantial infusion of federal funds. Incubating comparable models elsewhere will likewise require mobilizing direct state support. Community groups are organizing accordingly: in New York City, for example, Picture the Homeless helped to lead a campaign in 2017 that won a $1.65 million technical fund from the city to support the expansion of community land trusts. Dudley Street Neighborhood Initiative in Boston built its portfolio through eminent-domain powers. Some groups have been able to marshal private investment as well, such as T.R.U.S.T. South Los Angeles (founded in 2005), which has raised $5 million in equity from private and public sources for land acquisition, in conjunction with a development partner, to complete two large-scale, affordable, multi-family mixed-use projects. Given the billions of dollars currently spent on tax breaks for developers and individual homeowners, resources clearly exist to support alternatives. Directing them toward lasting, non-market alternatives is therefore not a financial challenge, but a political one. It’s also important to recognize the role that “defensive” organizing can play not just in stemming the current harms of the affordability crisis, but in facilitating the transition toward decommodified housing. Real-estate speculation depends on the ability to find “efficiencies” in “undervalued” properties. According to the Association for Neighborhood and Housing Development in New York City, investors often purchase buildings for upwards of many times what the annual rental income is worth, on the assumption that the rent-stabilized tenants can be bought or pushed out and replaced by tenants who can afford to pay the higher market rate. All of this is easier when the tenants aren’t organized. As Roberto de la Riva from Inquilinxs Unidxs Por Justicia in Minneapolis notes, “As soon as we organize a building, a landlord wants to get out, because they know they can’t make as much money as they could before.” Similarly, legislation protecting tenants’ rights, rent control, and supports for social housing help exert a counter-pressure on the market. Over many decades of fighting for their homes, everyday people have come up with ambitious, creative solutions to address their needs when the existing options have not. They did so with few resources and many obstacles in their way. Today, those solutions and other non-market alternatives are edging back into mainstream debates. Recent reports by the Democratic-aligned Center for American Progress and the left-wing People’s Policy Project, for example, as well as congressional candidates like Hawaii’s Kaniela Ing, have called for large-scale social housing and CLTs. Achieving such transformation, to build a truly democratic, equitable housing system for all Americans, will require campaigns like Homes for All to continue to grow into a social movement as large, powerful, and bold as its vision demands. Gianpaolo Baiocchi is a scholar and activist in New York City, where he directs the Urban Democracy Lab at NYU. His most recent book on popular democracy is We, the Sovereign (Radical Futures, 2018). H. Jacob Carlson is a PhD candidate at the University of Wisconsin-Madison. He is currently based in New York City, where he is researching the causes, consequences, and solutions to gentrification and displacement.